UKRAINE UNVEILED THE world’s largest moveable metal structure over the Chernobyl nuclear power plant’s doomed fourth reactor to ensure the safety of Europeans for future generations. The gigantic arch soars 108 metres (355 feet) into the sky – making it taller than New York’s Statue of Liberty – while its weight of 36,000 tons is three times heavier than the Eiffel Tower in Paris. The €2.1 billion structure sponsored by the European Bank for Reconstruction and Development (EBRD) has been edged into place over an existing crumbling dome that the Soviets built in haste when disaster struck three decades ago. Ukrainian President Petro Poroshenko was visibly proud at his impoverished and war-torn country’s ability to deal with one of the worst vestiges of its Soviet past. “Many people had doubts and refused to believe that this was possible,” Poroshenko told the festive ceremony held in front of the gleaming new dome. But my friends, I congratulate you – yes, we did it! Radioactive fallout from the site of the world’s worst civil nuclear accident spread across three-quarters of Europe and prompted a global rethink about the safety of atomic fuel. Work on the previous dome began after a 10-day fire caused by the explosion was contained but radiation still spewed out of the stricken reactor. “It was done through the super-human efforts of thousands of ordinary people,” the Chernobyl museum’s deputy chief Anna Korolevska told AFP. What kind of protective gear could they have possibly had? They worked in regular construction clothes. The Soviets sought to try to cover up the accident that was caused by errors during an experimental safety check and its eventual toll is still hotly disputed. The United Nations estimated in 2005 that around 4,000 people had either been killed or were left dying from cancer and other related diseases. Authorities maintain a 30-kilometre-wide exclusion zone around the plant in which only a few dozen elderly people live. One of the main problems of the Soviet-era response was the fact that it only had a 30-year lifespan. “Radioactive dust inside the structure is being blown out through the cracks,” Sergiy Paskevych of Ukraine’s Institute of Nuclear Power Plant Safety Problems told AFP. Paskevych added that the existing structure could crumble under extreme weather conditions. The new arch should be able to withstand tremors of 6.0 magnitude – a strength rarely seen in eastern Europe – and tornados that strike the region only once every million years. Kiev has complained that European assistance was slow to materialise. The shelter was edged towards the fourth reactor in just under three weeks of delicate work this month that was interrupted by bad weather and other potential dangers. It will later be fitted with radiation control equipment as well as air vents and fire fighting measures. The equipment inside the arch is expected to be operative by the end of 2017. “Only then will we begin to disassemble the old, unstable structure,” State Nuclear Regulatory Inspectorate of Ukraine’s head Sergiy Bozhko told AFP. But he said no timeframe had yet been set for the particularly hazardous work of removing all the remaining nuclear fuel from inside the plant or dismantling the old dome. Novarka believes that its arch will keep Europe safe from nuclear fallout for the next 100 years. Email “Giant €2.1 billion dome edged over Chernobyl power plant as existing one crumbles”. 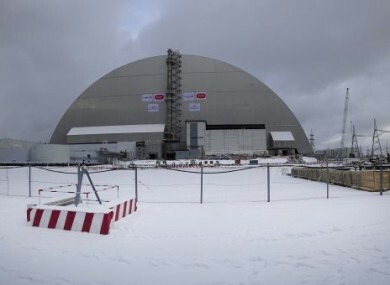 Feedback on “Giant €2.1 billion dome edged over Chernobyl power plant as existing one crumbles”.